Who works at the university and on what terms? We began our understanding of each of our ethnographic research through Maurizio Lazzarato’s theory on “immaterial labour.” According to the Italian sociologist and philosopher, “immaterial labour” is work that combines intellectual, manual, and entrepreneurial skills for which workers are required to use creativity, imagination, and technical labour to produce cultural-informational content. Although Lazzarato emphasizes the “immateriality” of both the work, or “labour” invested, and the product itself, throughout our ethnographic research we recognized how immaterial production is itself an embodied labour that has a material aspect. Embodied workers at the University produce both material and immaterial content which in turn produces affective and cognitive states. As opposed to University workers such as faculty and administrative staff, whose labour is immediately visible, the workers we followed through our ethnographic research operate largely ‘behind the scenes’. This invisibilization is in fact critical to the naturalization of the various affective and cognitive states that are actively produced by the University, like perceptions of equity, security, and the University’s academic excellence. a) The everyday duties and functions of security officers (studied by Joanna) are obscure and carried out largely behind the scenes. But their very presence, that of bodies in uniforms, actively projects an affect and atmosphere of safety. b) The communications workers at the U of T (studied by Mirae) are required to produce highly visible content which correlate with the three main priorities (as set by the president, i.e. excellence in undergraduate programs, internationalization, and city-building) and the overall image-making of the institution. However, the workers themselves, as well as the work invested, are highly invisibilized. Typically, there is no specific acknowledgement of particular workers who produced the content. At the same time, these workers (and work) are intentionally hidden and generalized under broad title of “communications” or “media relations” team. c) The University enjoys a reputation of being an equitable and diverse institution: it has been ranked Canada’s top diversity employer for consecutive nine years. Although this image is actively produced by the University and negotiated by employees at its Anti-Racism and Cultural Diversity Office (ARCDO, studied by Lama), these processes are not visible to most. By obscuring these fraught processes, the University constructs its image as equitable and diverse as natural or automatic, rather than actively produced and resisted. The workers we looked at in our ethnographic research operate with a high degree of agency, in that their work requires creativity and involves a lot of independent decision-making and problem-solving. This is in part due to employees’ relative isolation within the work-structure. Employees carry out their tasks with little supervision from their superiors and are often isolated from their co-workers. The isolation that employees experience is institutionally embedded. That is to say that it provides the agency and freedom needed to make this kind of creative work possible. Workplace isolation is also institutionally embedded in the sense that employees still channel their creative faculties in the service of the University’s mandates of image and reputation management despite the relative autonomy they enjoy within it. a) The duties of security guards involve many instances of unilateral decision making power, often prompting the guard to act quickly and upon instinct. Guards work and patrol alone. Their only interaction with other guards is to convey information at the end of each shift. They also have minimal supervision while on patrols. b) Due to the decentralized structure, faculty-based communications workers are often “isolated,” or disconnected from other communications workers at the U of T, therefore little interaction occurs among them. The central communications team takes on the role of integrating the projects of faculty-based workers. These workers have creative freedom to experiment and create appropriate content/materials for the faculty; however, this freedom still operates within a framework enforced by central communications, such as use of particular templates, and promoting the ultimate goal of the institution. c) ARCDO employees are isolated from the larger Human Resources and Equity (HR) structure in which they are embedded. They do not formally interact with or report to HR staff on a regular basis. The isolation that ARCDO employees experience gives them the space and creative freedom to do the kind of anti-racism work they feel is valuable and necessary for the institution. However the fruits of their efforts are often appropriated by the University to market itself as equitable and diverse. In this way, the relative autonomy ARCDO workers enjoy within this workplace structure is ultimately channeled in service of the University’s mandates of image and reputation management. We found the “work-study” student to be an interesting figure for the analysis of work and the neoliberalization of the university. A work-study student seeks out positions for part-time work at the university through faculty or departments and is paid a minimum wage to do clerical work and other random tasks. He or she could be a student in any year of their degree who is looking to build their CV or actively pursuing graduate studies. The work-student recognizes the apparent need for work experience to supplement in-classroom education while at university in order to be employable in their futures. Bridging research themes one and two, the work-study student represents a liminal figure: a student, who is also a worker, and who is attempting to prepare for a future of work or become work-ready all at the same time. The figure of the work-study student emerges within two separate but overlapping processes related to the neoliberalization of the university. The first being the precaritization of workers within and outside of the university; increasingly jobs are being outsourced and contracted to part-time, casual workers – work-study students among them. The second process which the work-study student draws attention to is the changing role of the university within neoliberal society; the university is transforming from being a commons of knowledge to being an education factory dedicate to producing work-ready students. The work-study student is the personification of these processes and the new role and function of the university in the neoliberal era. The central theme of this ethnographic project has been to evaluate the nature and particularities of work at the university. Our research team chose to focus on the work that is done at the university to produce students as ‘work ready.’ The overwhelming assumption among students, faculty and the larger society is that upon graduation, students will enter the labour market employable and able to contribute productively and efficiently to meet the needs of the neoliberal work society. Yet finding work is difficult. Hence the university is no longer purely an academic space focused on offering education, but has become a future oriented space that aims to provide knowledge and prepare students for their futures in work. We studied the qualities of the work ready student, the processes by which the work ready student is produced, and the values which this kind of student embodies. We drew our data from participant observation and interviews at the University of Toronto’s Career Centre and related programs, and from facilities such as the Centre for International Experience, and the Co-Curricular Record system which seek to instill a similar “career minded” subjectivity within the student. Who pursues career oriented resources and services at the University of Toronto? Typically an upper year student: the Career Centre notes that it is most common for students to access career-oriented services in their third, fourth or fifth undergraduate years or while completing a Masters. This is because the upper year student is more aware of the need to enter a future of work, and the nearness of the time when they should embark upon their career evokes anxiety and disarray. By contrast, lower year students are concerned mainly with their experiences within the university and finding an academic foothold rather than beginning to imagine their still distant career futures. Often international students: the majority of students accessing the Career Centre are international students. Some career educators at the Career Centre argue this is because there is a certain anxiety associated with being situated within a new job market as international students are unfamiliar with the particularities of the job scene. Students who want advice/seek guidance/assistance with particular tasks, eg CV. What qualities are expected of the work ready student as promoted by career oriented services? Individual: Career services are tailored to understand career paths as individual processes rather than collective processes within the broader job market or conditions of labor availability. The onus is placed on the individual to pursue, define and re-define their own career trajectories based on personal contingencies and circumstances. Responsible: The work ready student does not expect to have their hand held in the job market. They take the onus to prepare themselves for their futures of work. Ambitious/proactive: The work ready student is a ‘go-getter’. They consistently work and put in the time to make themselves employable. Marketable: The work ready student is able to market themselves by using the right language to make their experiences intelligible in career terms. The student is made marketable on their resume, cover letter, co-curricular record, etc. What are the general processes by which the work ready student is produced? Seeking out experience: The student pursues experiences at the university which will help them gain work relevant skills. The university makes these experiences available to students and promotes them as being relevant to the student with futures of work in mind. These experiences include work study, internships, paid or unpaid work and volunteering at the university, as well as similar international experiences abroad. Competency-making and skills translation: The work ready student has a strong understanding of the language and competencies desired by the labour market. They have the ability to translate their “lived experiences” into the appropriate work related categories through which skills and competencies can be highlighted. Resume making and presentation of self: the work ready student presents themselves as work ready on a resume. The resume is important for the work ready student because it makes their skills, experiences and competencies intelligible for the employer, through processes of translation. Disseminating knowledge: The work ready student is the subject of the dissemination of knowledge. The student is provided the most up to date and “helpful” career resources/knowledge: theories, practices and labour market ebb and flow. The work ready student is provided the knowledge of how to create a resume, a cover letter or how to network, and is expected to accept this knowledge and incorporate it into their own personhood, adopting the subjectivity of a neoliberalized work ready student. Networking: The work ready student understands networking as an integral process to creating futures of work. All forms of social interaction are made into opportunities to network. The work ready student instrumentalizes their social interactions as tools to promote themselves. Creating future imaginaries: Career oriented resources at the University draw students into a “career world” where they are encouraged, through workshops, dialogue and counselling services, to imagine and re-imagine their futures. Students are encouraged to map their future life plans and career trajectories, laying out their pathways, obstacles and barriers. After knowledge is disseminated, students are encouraged to take the knowledge offered through these services to re-work, re-define and re-signify their future work imaginaries. The result is the creation of an institutionally mediated and prescribed subjectivity which the student comes to embody. Subject-making: The work of philosopher Michel Foucault was used to explore the notion of subject formation, specifically in reference to the subject of the work ready student. The work ready student is both a subject of and subject to the the neoliberal university. The positionality of the work ready student is produced through a series of forces including workshops, programs, services and ideologies that constructs a particular type of student that reflects the ideals of the labour market. To sum up, the production of the work ready student involves very particular processes which are enacted on a collective of students and recent graduates towards the creation of an embodied “career minded” subjectivity. As the university becomes increasingly neoliberalized it will be important to continuously assess the fluid nature of these processes and the changing subjectivities of the work ready student. By following the promotion of entrepreneurship at U of T we found ourselves confronted with contradictory messages. There were days when we went to an event in the afternoon and learned about how Toronto could be the next Silicon Valley, how we could create a very profitable startup and generate millions within a matter of years. Then we went to another event in the evening with a completely different outlook on life and learned about social entrepreneurship and ways to create systematic change in communities using technical skills. Entrepreneurship is imagined as a space addressing issues as diverse and contradictory as the creation of wealth through profit and mitigating social injustices. The promotion of entrepreneurship at U of T centers around students creating tech startups, either while in school or after graduation. Students are taught to take risks, encouraged to start their own enterprise based on creating an innovative product that will allow them to enter the market, and either scale up their company or produce desired change, or both. Entrepreneurial work as it is imagined in some of these venues relates interestingly to wage work as its apparent opposite: entrepreneurs ideally create and own their means of production, at least initially. Whereas growing one’s own business is related to aspirations of wealth, escaping wage labor is related to aspirations of freedom. However, students were more skeptical and saw entrepreneurship as one of many options for work. The risks involved appeared intimidating for a recent graduate, but the idea of entrepreneurship later on in life held the promise of freedom from a dreaded nine-to-five job. Entrepreneurship as a line of work for recent technical department graduates has, therefore, an apparently marginal position. This is probably why so many different actors within the university constantly promote entrepreneurship as an alternative life path for students who don’t necessarily anticipate entrepreneurial futures. Having carried out in-depth qualitative interviews of current U of T engineering students and also attended various engineering entrepreneurship events, Mehran used her data and ethnographic observations in her research project to specifically focus on the promotion of entrepreneurship at U of T by various actors and how students perceive or respond to this entrepreneurship exposure or “evangelism”. Leyla’s research project looks at the way in which entrepreneurship – as a “way of being a person” : the entrepreneur – is promoted at events seeking to transform technically able students into entrepreneurs alongside, or perhaps as an alternative to preparing them for future work lives as employees. The Center for International Experience (CIE) is an office of the Student Life at the University of Toronto. In the course of my undergraduate I have spent a significant amount of time in and around the CIE, learning about different international experiences, exchanges and courses which are available at the university. I have noticed that a prevailing question, posed at different information sessions and workshops put on by the CIE, is “how will this help me get a job?”. This question makes sense in relation to how much time and money these international experiences normally require. While students interested in international experience opportunities obviously want to hear that an exchange, course, or internship abroad will guarantee them an edge when they go to look for work after graduation, this is not tangibly true. The CIE’s relevance to producing employable students is tenuous. My fieldwork observation of different events and information sessions at the CIE proves that, while the CIE acknowledges its tenuous relevance for students concerned with their futures of work, it still looks to construct a relationship between international experience and futures of work by emphasizing that going abroad will help students get a better sense of what they want to do in their futures. The CIE is constantly involved in different promotional and recruitment events and presentations. There are larger-scale events such as the Go Global Expo or the International Exchange Expo, as well as smaller scale presentations to individual colleges, departments or other smaller subsections of the university. In such events and presentations to prospective students there is a recognizable reliance on conjecture and hindsight reflections to prove the relevance of international experience for future employability – a tangible hope and concern of interested students. For example, when giving presentations, representatives of the CIE rely heavily on anecdote and past participant examples in talking about the relevance of international experience to future employability. Then, when asked specific questions by students (or by me, in my interviews) concerning how international experience can improve networking skills, can produce future job prospects or can produce other direct or tangible employment opportunities the overwhelming answer is that students who pursue international experience end up getting a “better sense” of what they want to do in the future once they return, which apparently helps their futures of employment. This sentiment, of getting a ‘“better sense” of what you want to do’, is one heavily relied on by the CIE to forge a connection between employability and student experience. For a specific example, I refer to the university’s Go global Expo, hosted by the CIE, which I attended and where I observed the internalized reproduction of this sentiment by students and officers of the CIE alike. At one of the booths set up for the expo there sat two CIE officers with a stack of markers and a white poster board in front of them. 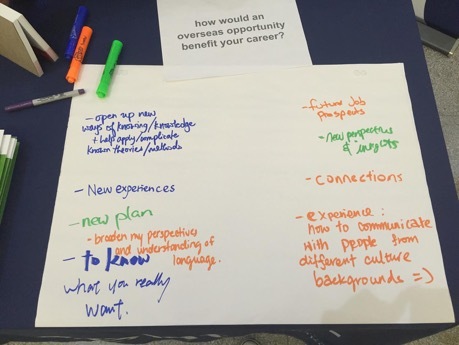 At the top of the poster board was the question, “how would an overseas opportunity benefit your career?”, and beneath it, on the poster, students were encouraged to jot down their own conjectures regarding this question. The answers were eerily reminiscent of exactly the same sorts of conjectures made by the officers of the CIE during their presentations and information session to relate student experience to future employment. The student contributions included (see photo below): “open up new ways of knowing”, “new experiences”, “new plan”, “new perspectives and insights”, “experience how to communicate”, and the like the cherry on top, “to know what you really want”, or in other words, to get a “better sense”. None of these conjectures directly assume a relationship between an overseas opportunity and tangible aspects of employability like networks, resumes, or job prospects – just as the CIE officials avoid doing so in their presentations and interviews. Instead, the CIE presumes on a tenuous, blurry relationship between international experience and future employability based on getting a better sense. I like to think that, in terms of international and co-curricular experience, I am as weatheredas any fourth-year undergraduate student at this university. I have myself gone abroad multiple times (through the university and otherwise) and I have held work-study and research intern positions at the university. Given my own experience as an undergraduate, I have come to describe the condition of being a student in today’s university as having a wealth of opportunity and no idea what to do with it all. It may seem counterintuitive, and perhaps even ungrateful, but I have come to see the effect of having so much opportunity as, ultimately, stress. I have experienced this stress as not knowing which international program to pursue, which professor to lobby into being my research supervisor, which work position to dedicate myself to, or which clubs to volunteer for. This stress is different from the average condition of the socially-anxious and perpetually stressed undergraduate student because it is specifically associated with two main realizations: First, I have realized that undergraduate students stress when we are exposed to an amazing number of interesting, exciting opportunities, with only a limited time to pursue them on top of required undergraduate work. Second, undergraduate students stress because we cannot merely pursue experiences at clubs and other social activities for our personal interest anymore, we must also be constantly aware of how these experiences will look on our resumes for employers in the future. To supplement my own experience in this respect, I will defer to Jason Read to explain the condition of the student today more succinctly. In his contribution to a publication from the Edu-Factory Collective, Jason Read analyzes the university experience as one of “neoliberalism against the commons” wherein the student is immersed not only in a commons of knowledge production, but at the same time is implicated in an antithetical process of neoliberal restructuring and subject formation. Read nods to the tension which students feel at university when they must balance their own education as well as mediate their own neoliberal subject formation. It is the latter part of Read’s characterization which I am interested in here. Read writes how the student, when free from other demands like required school work, needs to make important decisions about how to spend their time in clubs and social activities because it is through these extra-curricular experiences that the student is both trained as a future employee and (simultaneously) produced as a neoliberal subject. He makes the point that experiences are chosen in a specifically neoliberal mode of self-fashioning or self-recruitment where the student sees “every activity or club [as] a possible line on a resume” (Read, 2009:151). While it is generally understood that going to university is an investment in the human capital of the student as future productive member of society, Read writes how each and every decision made while at university has been recast as an investment in human capital. Read’s insight corresponds to an observation made by Michel Foucault, that neoliberalism is the process by which everyone (in this case, students at university) are refigured as human capital, and thereby all experiences are also refigured as investments in said capital. Read criticizes this recasting of student experiences in extra-curricular clubs and activities by mockingly quoting the student who asks of every experience and opportunity presented to them “at practically every college or university…‘how will this help me get a job?’” (Read, 2009:152). While I generally agree with how Jason Read characterizes the student, as foremost concerned with getting a job in the future, my experience and the research I conducted for this project indicates that the more immediately relevant question for the student to ask should be instead, “how will I write about this on a resume?”. At the University of Toronto, student services, like the Center for International Experience and the Co-Curricular Record, are in place to provide experiences relevant to the question which Jason Read relays, whereas the Career Center plays an integral role in answering my more immediate question concerning the resume. While of course, these two questions, “how will this help me get a job?” and “how will I write about this on a resume?”, are related in that the resume is (usually) a necessary requirement in getting a job, I argue that it is more important to ask of an opportunity, “how will I write about this on a resume?” because in order for student experiences to be perceived as relevant to future employers they need to be written down and ultimately translated onto a resume. “How is this process of translation done at the Career Center?”, you ask? Read on to my next blog post, Experiential Translation and Resume Services, for what I found out! In a previous blog post, The Student’s Dilemma, I suggested that the most important question which students should ask of any opportunity or experience they pursue at university should be “How will I write about this on a resume?” because the resume is the only normative form of communication which exists between students and their future employers outside of the university. For guidance in analyzing how students get help from resume advisors at the Career Center to translate their experiences onto a resume in a normative and appropriate way, I drew on the theory of Naoki Sakai and Jon Solomon, from the Edu-Factory Collective. Their work helped me to understand the importance of producing a normative resume (and thereby the importance of resume advisors in helping to produce these normative resumes) in order to efficiently and effectively communicate experiences in university to employers. Sakai and Solomon discuss subject formation in similar ways to how I have discussed it. They are writing on the formation of the subject using the concept of culture to communicate, codify and translate difference across global populations, while I am writing on the formation of the employable and neoliberal subject using the resume to communicate, codify and translate experience between students at university and employers. Their theoretical contributions are helpful to understand the imperative of translation at the Career Center in the process of subject formation at the university. Sakai and Solomon quote Maurizio Lazzarato and Toni Negri writing on Immaterial Labor in order to understand the primary imperative in subject formation as communication, which is defined by Lazzarato and Negri as “a simple relay of codification and decodification, whose transmitted message must be clear and without ambiguity within a context of communication that has been completely normalized” (132). Sakai and Solomon’s insights are important to understand why the resume is important to communicate to employers in a normative way. Considering the resume as a normalized form of communication between students and employers, the “transmitted message” which must be clear in communication are the skills and competencies gained by students through experience. Further, if communication is “the process of encoding/decoding…to transfer informational content between different…spheres” (133), then communication can be seen, following Sakai and Solomon, as a form of translation. On its most basic level, what Sakai and Solomon refer to in discussing the imperative of communication for the formation of the subject across global populations, is a form of cultural translation. Building on their work, I consider the imperative of the resume for the formation of the employable subject as experiential translation. The question that I now ask is how, exactly, this experiential translation is done. At the University of Toronto, experiential translation is the work of peer resume advisors at the Career Center. In my own experience, through my participant observation and through informal interviews with resume advisors at the Career Center I have identified three specific normative categories which resume advisors focus on in translating experience onto resumes for their peers. These three specific focuses are (1) format, (2) content and (3) aesthetic, which correlate to three specific aspects all (apparently) expected by and important for employers who read resumes and are interested in students’ international and co-curricular experience. Here, I will clarify the process of experiential translation and identify it as the last step in the process I have described by which students are made employable (and neoliberal) subjects at university. According to resume advisors, the aesthetic of a resume is important for ensuring that employers take your resume seriously. Advisors suggest that clean white paper and black traditional font are the normative expectations that employers have for resumes. According to resume advisors, the format of the resume is important for ease of reading. In editing the format of resumes advisors specifically focus on the use of short sentences, the structure of sentences, the tense of sentences, and the use of bullet points to communicate the message efficiently. They suggest the use of succinct phrasing, past or present tense wording (depending on the timeline of employment), and bullet points for elaboration of independent points. Arguably, aesthetic and format are important on the resume if only to get employers to pause and read it but the real imperative aspect of the resume is its content. Resume advisors have one specific form of advice for the content of the resume – they suggest the use of simple keywords and buzzwords which relate to your experience. Basically, the resume advisors suggest to distill your experiences, skills and competencies down into a few strategic words which will be relevant to employers. Sakai and Solomon theorize the use of distilled buzzwords which advisors suggest for resumes, as “strategic essentialisms” (Sakai & Solomon; 2009:133); they suggest that strategic essentialisms contribute to the efficient communication of message in a normative way. Resume advisers suggest the same; that using normative strategic essentialisms (singular words or phrases) such as “problem solving”, “communication”, “initiative”, “responsibility” and “independence” will ensure that the employers know what kind of experience you have had, and the phrases will be recognizable to them and easily related to the job description. International Experience, Co-curricular Work and Resumes: What is the Point of it all? Writing for the Globe and Mail, Todd Hirsch, a Canadian economist specializing in analyzing the contemporary job market, takes it upon himself to apologize, on behalf of society, for the widespread assumption that students are supposed to be employable when they graduate from university, and that the university’s purpose is to prepare students for futures of work. “We are sorry” he says, “if we led you to believe that attending university would land you a good job” because, evidently, this is not true. He goes on to write that university education was never intended to land you a job right out of graduation – “it was intended to make you a more complete thinker”. Quite simply, he says, university education was “intended to teach you how to learn”. For any graduate, the reality of employability depends on the nature of the job market, the economy, a lottery of open positions and, ultimately, a world of variables beyond their control. Todd Hirsch adds to this list that graduates who apply for jobs often limit their chances by pigeonholing themselves; they expect to only get jobs relevant to the experience and skills they have from the degree they earned at school. He suggests that this is wrong, and that it is not what is intended of the undergraduate degree. Before conducting my research for this project, when I read Hirsch’s suggestion that the undergraduate degree was “intended to teach you how to learn”, I initially understood him to mean that the undergraduate degree is only as good as what you learn from a book or in a classroom. However, I now understand it to mean that the undergraduate experience is meant to teach students how to take advantage of the opportunities made available to them beyond the classroom , to learn from these, and to continue to learn after graduation while shuffling through different lines of work until finding something to be good at and passionate about. This revelation that I have had suggests that the important question for students to ask at university when faced with amazing opportunities, is not what Jason Read suggests, “how will this help me get a job?”, nor is it “how will I write about this on a resume?” as I have previously suggested in another blog post, but it is: “what am I here for?”, “what am I good at?” and “what do I love?”. This question, “what am I here for?” which is posed by Hirsch means to say that the ultimate challenge of the student should not be to see how they can take advantage of experiences to help them get a job, but “to find what you’re good at, and keep getting better and better at it”. I have seen, in the course of this ethnographic project, that as much as it is important to put your best self forward in a resume, by taking advantage of the experiences made available at the university, as well as career services to help with the necessary process of translating experiences onto a resume, the ultimate imperative is to get a better sense of what you want to do with the rest of your life and to never give up this process. As per the Career Centre’s request, it is important to frame the context of this paper with the disclaimer that throughout my period of research, the Career Centre (CC) was under renovation. Hence ‘operations as usual’ were disturbed. Despite the logistical challenges, 429 workshops were offered in 2015-16, with about 2665 attendees, representing approximately ten percent of the Career Centre’s total client volume. As of Fall 2016, the Career Centre employs a staff of 37. Of these, 18 are “student workers,” or, current undergraduate and Masters students providing peer-to-peer services. Certainly then, the Career Centre is its own institution within an institution. My research does not attempt to evaluate the quality of Career Centre programming or programmers. Indeed, my work will give heed to, but will not explicitly focus on, the substance or content of the knowledge offered by the Centre. Instead, my focus is on analyzing the effects of the pedagogy and knowledge provided through workshops. I seek to follow the trajectory of career-focused knowledge production, to assess where it goes, what practices it sets in motion, how it is transformed and what, in actuality, it achieves. I have increasingly become interested in what unites students at Career Centre workshops. Why do they attend? What draws them in to attend? Once they’re here, what is the collective action, opinions and normative framework of behaviour at these workshops? Collective effervescence, as defined by Durkheim, allows members of a group to act through the internalization of society’s pressures while mobilizing active forces and external energies. If the group is incarnate, then what forces are pulling these students and recent graduates to assemble? Is it the embodied social forces inherent to living in a work society defined by underemployment, precarious work and labour exploitation that unite students of a prestigious university? Why is it that students take supplementary action (ie. accessing career-oriented resources) to advance their careers? Do they believe that simply having a degree is insufficient? Like Shortly (2016), I see the limits to Durkheim’s theory. There are certainly patterns to these workshops, whether or not students have attended before. It seems that every student knows how to “properly” behave – where to sit, how to act, what questions to ask and how to feel (namely, anxious about finding meaningful work, but prideful in “taking the right steps in the right direction” via attendance). But, there also appears to be division: when asked to organize into sub-groups, students frequently group with those in similar disciplines. To stratify further, those in the same discipline at the same educational level (ie. masters students with masters students) consistently scout out one another for partnership to the exclusion (perhaps devaluation?) of others. Certainly, this leads to the emergence of new and refined boundaries of the group. Further, Durkheim argues that through the collective effervescence of the group incarnate, members become “transported into a special world” (p.250). What is this world, as envisaged by the CC and occupied by students? I argue that one characteristic of it is the discursive devaluation of the present. Both students and educators consistently refer to the future, specifically the ‘working-future’ (ie. when students come to have careers), as the “real world.” I believe this devalues the students’ current role, which is unequivocally tied to their futures. Indeed, for most of us, enrollment at university (both the rank of the institution and the specific discipline) is integral to the success of our occupying meaningful future careers (the expressed goal of many students) – so what is the purpose of referring only to the career-oriented future as the ‘real world’? Perhaps, rather than casting judgement, we could understand this as the ontological embodiment of the work society? Or, following Weeks, could this reflect the way in which our lives are centred around work? Religious Life (1912), 207-236. Translated by Karen E. Fields. Free Press, 1995. Shortly, Anna. “Board Proposals, Bingo, and a Band: Strength in Numbers at the University of Toronto Students’ Union’s Annual General Meeting.” Ethnography Lab. University of Toronto, 6 Apr. 2016. Web. 14 Nov. 2016. . Throughout my research, I found myself consistently asking: what is the essence, or common themes, at workshops? Emile Durkheim notes that through the state of assembly, members of the collective come to embody particular systems of ideas, normative frameworks, social rules, shared beliefs and affect come to exist. One system of ideas central at Career Centre workshops which attendees are provided by Educators, is the potentiality of failure in future career trajectories. Here, Educators allude to the future career paths of attendees, such as the career search and application processes, as dynamic and constantly changing. One Educator, in a particularly memorable metaphor, suggested to the group that “mapping your career path is like running into the fog.” This sentiment was echoed by another Educator, as they suggested that “work disassociates us from ourselves and our identities.” What’s more, in an interview I conducted with an Educator, they noted that it is their duty to empathize with students and help them “realize that failure is possible and even though [they are] working hard, [they] may fail.” Indeed, it is this ideological “bleakness of the future,” seemingly underlying the necessity of the workshops, which becomes a defining belief perpetuated by the Career Centre. However, as stated, the Career Centre draws attendees into normative regimes of action and thought characterized by contradictory and incompatible finalities. Another such set of ideas that permeates the boundaries of the Career Centre world is an ideology of neoliberalism. By neoliberalism, I mainly refer to the tenets of responsibilization (you must do all you can to be ready for your career) and individualization. Workshops are underpinned by a concept of self-responsibility: the onus is upon the student at the workshop to work to make themselves ‘work ready.’ Implicit in this, is the idea that the Career Centre workshops are limited and act simply as a “guide” for students. As one Educator noted: “I can’t force the student to learn and change, I can only offer them my knowledge and hope they’ll take it.” Here, the self-responsibility ideology is laden with contradiction, as it acknowledges that there are limits to the Educators’ ability to make a student ‘work ready,’ as the responsibility ultimately falls upon the student. One example of Planned Happenstance permeating the Career Centre world and defining the boundaries of collective social action, thought and normative behaviour is the concept of ‘networking.’ In the Career Centre world, attendees are encouraged to redefine seemingly banal tasks into those that are career intelligible. Attendees are taught to view workshops as ‘networking events:’ opportunities to connect with recent graduates and academic colleagues of both similar and diverse fields. These ‘networking’ opportunities are encouraged through ‘think-pair-share’ activities, wherein attendees engage in a rotating carousel of self introduction or discussion. Thus, at once, attendees come to share the thought that mere human interaction at workshops can be transformed into social capital that can be made instrumental, or optimized to work towards the advancement of career opportunity. Finally, the Career Centre world into which attendees are transported is characterized by a specific discourse on what constitutes the “real world.” As discussed above, workshops and the collective thought and action of attendees are intimately bound to notions of the future. Indeed, in their essence, workshops are future-oriented. As attendees bind together through collective thought and action that is hyper-focused on the future, a discourse which devalues the present sweeps the room. Here, both students and Educators consistently refer to the ‘working-future’ — or, when attendees come to have careers — as the “real world;” or work as “reality.” Implicitly, this devalues the current role of the attendee, namely the role of the university student, as it constructs a dichotomous ideological system where “the present” becomes interwoven with notions of insignificance or triviality; while the “future” (career future) becomes an ordained goal. Certainly, this creates a value system where attendees join together in identifying the present as a mere means, while the future becomes the ends. This value system reified in the Career Centre world is evidenced in an interview I conducted with an Educator, who confirmed that “whatever we [students] are doing at University is made to seem insignificant.” Indeed, this Educator became increasingly alarmed at the Career Centre’s role in constructing this discourse of “reality,” leading them to state that “the Career Centre should be playing more of a role in demystifying this understanding of the ‘real world.’” This same Educator noted later in the interview that for attendees, it’s incredibly easy to “slip in to” valorizing future work “when everyone and everything” at workshops is so future-oriented. While perhaps this future work orientation is precisely what one would expect of a career centre, it is the ‘zero-sum game’ nature of this orientation which raises concerns about the value system postulated by the Career Centre in a University. Here, the contradiction is this: in exclusively valuing future work, the Career Centre both neglects and devalues the significance of students’ current academic studies, making them appear irrelevant and instrumental, or, simply not valuable in themselves. Note, however, that this future work valorization is rather idiosyncratic, in that university education is linked to attendees’ futures, as academic performance is a prerequisite for getting a job. Through this zero-sum future work valorization, I would suggest we understand the role of the Career Centre pedagogy as creating a clear division between students’ current academic studies at the University and future work realities, causing students to see these as two very distinct and non-interrelated realities. Broadly then, Taylor’s theory of social imaginaries refers to the complex whole of how both groups and individuals come to envisage “how things are and how things ought to be,” thus directly referring to “the way people imagine their social surroundings” and the ways in which they can imagine their futures. I propose that it is the social imaginary which becomes consolidated through attendee’s participation at the Career Centre workshops and its particularities. Attendees, through the knowledge they accept, reject or assimilate at workshops and their shared sense of group membership, come to formulate understandings of their social environment and ways of imagining their work-futures. Adapting Kathi Weeks’ (2011) concept of ‘postwork imaginaries,’ we may title the CC’s output ‘futurework imaginaries.’ Futurework imaginaries refer to the way in which attendees who emerge from CC workshops with their peculiar set of ideologies, come to imagine their futures: the capacities they aspire to, the parameters they apply to their career aspirations or the ways in which they envisage feeling when they come to have careers. Generally, we can understand existence in the Career Centre world as providing the ideological tools which inform how one can imagine their career future. The futurework imaginaries embodied by attendees are intrinsically future-oriented. Yet, this future orientation, or future-thinking, becomes a mechanism to bound and circumscribe the imaginary of attendees. The workshops’ devaluation of the present, discussed earlier, means that these futurework imaginaries give little attention to the current role of students as students, or to the role of their studies in orienting their future. Instead, attendees come to ignore and negate the present in their imagination, and become hyper-focused on another, “real world” future. This was consistently exemplified at workshops, where student questions were rarely about how their current fields of study or courses taken would influence their career trajectories or aspirations. Instead, student focus was always on concrete, future oriented aspects of their career: how they will search for a job after graduation, what they will wear to their interviews, what type of jobs are “best” (ie. most secure, high paying, prestigious) to go into in Canada, will Masters program X get me a job in field Y? and so forth. Namely, they were imagining their career trajectories as beginning after university, rather than a trajectory they had already embarked upon. Thus, the understanding of the current social environment, or “how things are,” a critical tenet of the social imaginary, comes to be an insignificant tenet of the futurework imaginary. Why does it matter that the present is wholly neglected in these futurework imaginaries? It is important in that it causes students to overlook their current position in the university community, as students and intellectuals, as intrinsically valuable as an experience in itself. Arguably, this is problematic in that it places “work” at the centre of our lives. Certainly, in light of the quote “work to live or live to work,” the futurework imaginaries encourage the latter. Hence, quite unlike the social imaginary, the understanding of “how things ought to be” comes to dominate this imaginary. While the futurework imaginary is intrinsically tied to the attendees independent career trajectory, there exist “horizons of common expectations” in the ways in which students formulate and envisage their future trajectories. These common expectations include the instrumentalization of social interaction, friendship, social capital and the media, as they become vehicles to propel one’s career future. Examples from workshops include: friendships are to be made with the “right” kind of people: professionals in ones field or human resource recruiters; the media, namely, social media, is to be closely monitored for any “informal job recruitment;” while social capital or existing social networks are to be optimized toward getting “a foot in the door” with an organization where one may wish to work. Indeed, as Taylor postulates, the social imaginary is characterized by a reimagining of how fellow attendees and social actors fit together, relate to one another and what goes on between them. Generally, as I have gleaned from this short ethnographic research, attendance at Career Centre workshops comes to equip participants with a certain tool-kit, or a normative future outlook, through which they are able to understand their social setting and become capable of organizing and defining the parameters of their working futures. It is through the practices and particularities within the Career Centre that attendees come to redefine how, why, when, what and where they “engage one another” and transform the way in which they see both the present (as a means) and the future (as the ends). At a meeting with my “gatekeeper,” or, the senior staff member facilitating my continued operation in the field, I was asked to share some student feedback I had received through my attendance at Career Centre (CC) workshops. I mentioned that some students had been offended when they discovered that educators are undergraduates. I was verbally requested to share this feedback via writing, so that my gatekeeper could provide this knowledge to the Director of the CC, to firstly, demonstrate “how valuable [my] project will be for [the CC].” This valorization of institutional critique perhaps speaks to the pervasiveness of the audit culture at the CC, as discussed below. Drawing on Riles’ work, it is also interesting to trace the trajectory this feedback took, and the path it continues to move along. After the meeting, I sent my gatekeeper an edited version the relevant field report. The document now figured centrally as an ethnographic artifact, as I transformed it into a one paragraph email and sent it off. The staff member returned my email with a ‘thank-you’ note: “this is something we as a Career Centre need to dig deeper into” (private correspondence, Nov. 3). Also attached was my ‘report’, now in Microsoft Word format, with a request that I review the minor edits made, and give my consent. These aesthetic and format edits, while largely banal, reflect perhaps the now shifting control and ownership of knowledge production. I later received another email, with a formal request that I consent to having my document be incorporated into future strategic plans, annual reports and be shared with senior leadership teams (private correspondence, Nov. 4). At a ‘check-in’ meeting I attended with my gatekeeper, I noticed that the document had left the ‘techno-sphere,’ having been physically printed off and stored in a file folder. The document then, once an account of an observation of a past event, has become a future oriented anticipatory document, awaiting response and action: to be reviewed, disseminated and incorporated. As Hull notes in his discussion of ethnomethodology, the document changes social and material form as it moves from one setting to another, speaking to the documents’ relative fluidity. Certainly, this proves true: as my document began to be adopted as ‘internal knowledge’ and was ‘owned’ by the CC. The aesthetics of the document and its knowledge increasingly became bureaucratically intelligible: a formatted, dated, institutionally categorized (ie. it was specifically pertinent to the “Career Start” peer team, apparently) and physical document. But, what does this all say about the ‘audit culture’ which McKechnie (2015: 12-16) found to permeate Student Life at U of T (which the CC is a part)? Could the document have become an artifact embedded within larger audit culture? Perhaps, drawing on Strathern (p.189), it is both the subject and object of the audit process, as an enabling document (for institutional improvement seen in the staffs’ comment that they need to ‘dig deeper’), an evaluative document (to ensure money is being efficiently used, a key concern identified in their 2015 annual review) and/or as an evaluated document (ie. analyzed for its validity). In what ways does this future-orientation of the document reflect both the, perhaps mutually reinforcing, audit culture and the need for the CC to “jostle for recognition” amongst the many departments seeking increasingly meagre funds from the University as a corporate entity (Schwartz 2013)? Moreover, what does this bureaucratization of the document say about its ‘instrumentalization’ as a means of organizational control through its storage, circulation and transmission of information (Hull 2012: 257)? A document once outside the parameters of the bureaucratic organization was made intelligible from a contested space (ie. my insider-outsider role). What does this trajectory say about the CC assemblage, as my document interpolated, diverted and linked various actors (some knowingly and others unknowingly): students, myself, the workshop facilitators, my gatekeeper, the director and all those with whom the document is shared? As a reflective exercise, finally, what does this experience say about the way in which the CC ‘authorized’ my rather liminal knowledge, a critical aspect of the assemblage I find myself situated within. Indeed, without any information evidencing my academic and research quality or capacities, the knowledge I provided was immediately consumed and taken as fact. What does this say about the CC and its staffs’ affective desire (perhaps a process of joyful automobility?) to constantly render itself more effective, efficient, relevant to the ‘21st century’ and moving along the path of ‘improvement’ – a central aspect of the audit culture (Shore 2015)? Hull, Matthew S. “Documents and Bureaucracy.” Annual Review of Anthropology 41.1 (2012): 251-67. Web. 7 Nov. 2016. Student Services Practitioners in Creating Successful Students.” Ethnography Lab (2015): 1-22. Web. Riles, Annelise. “[Deadlines].” Documents. Detroit: U of Michigan, 2006. 71-92. Print. Shore, Chris, and Susan Wright. “Audit Culture Revisited.” Current Anthropology 56.3 (2015): 421-31. Web. 7 Nov. 2016. Schwartz, Zane. “The Role of the University Career Centre Evolves with the times.” University Affairs. N.p., 24 July 2013. Web. .